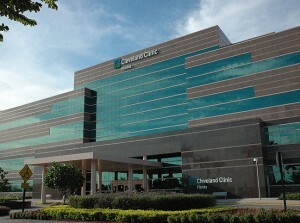 Cleveland Clinic Florida is a not-for-profit, multi-specialty, academic medical center that integrates clinical and hospital care with research and education. The campus includes diagnostic centers, outpatient surgery and a 24-hour emergency department located in a state-of-the-art hospital. An integral part of Cleveland Clinic, Cleveland Clinic Florida has more than 240 physicians with expertise in 34 specialties. They provide outstanding patient care based on the principles of cooperation, compassion and innovation. According to U.S. News & World Report, Cleveland Clinic Florida is ranked No. 3 among the best hospitals in the Miami-Fort Lauderdale metro area and is ranked nationally in gastroenterology. Maroone Cancer Center provides care to patients with cancer and is at the forefront of new and emerging cancer research.